For years, I did not read the paper–any paper. Then in January of 2009 I decided I needed my horizons broadened. 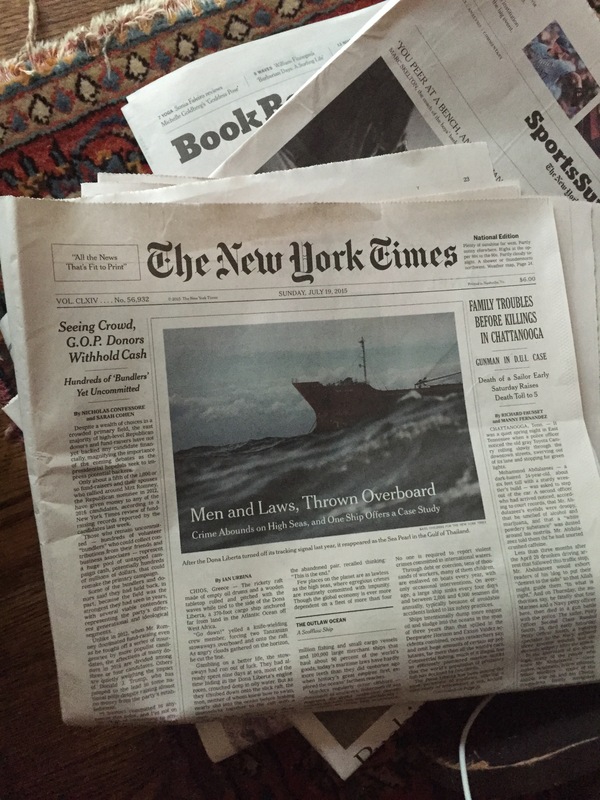 Now I read Sunday’s The New York Times. And I enjoy reading it. I have no books at all on my night stand, because if I read a book in bed I’ll get caught up in it and read till I’m too sleepy and forget half of it by morning and have to go back to the beginning. So I keep only a New Yorker on my night stand, which I do my best to eke out over the space of an entire week. It distresses me that The New Yorker publishes just 47 issues a year, which makes the eking-out process a mathematical challenge. I also subscribe to The New Yorker. Anne Tyler’s response makes me want to do what she does. But mostly I just look at the cover. This reminds me of my first “365” post almost four months ago (yikes), which was partly about the New Yorker. I haven’t gotten any better about reading it, though I said in that post I’d try…. Sigh. I also remember Anne Tyler saying something to the effect of, if she didn’t write fiction and create lots of (quirky) characters, she would have been forced to have affairs or do other crazy things: that fiction kept her (and her marriage) safe. Anne, I remembered your post as I was adding on the Anne Tyler quote from The New Yorker–then I had to come clean about only enjoying the cover! Thanks for that other bit from her too. I used to read the New York Times and The New Yorker plus other magazines, plus books, cover-to-cover, while I held a demanding job. It astonishes me to think of this now. I am slowly returning to reading, but I doubt it will ever be at my old levels. I remember that Anne Tyler answer, which made me laugh because books keep me awake if they are nearby at night, and because it was such an Anne Tyler—I love her so—answer. I read the New Yorker in hard copy, pretty much all of it, or whatever interests me. I also read the New Yorker daily “Newsletter” on my IPad or phone. At night in my tent overlooking Dabob Bay in the Northwest forest, my cat Elizabeth and I read the Guardian to see what the Brits think of us. They think our police shoot a lot of black people. Their book section is the best! The Guardian is way more I-Pad friendly than the NY Times, which I also read on my phone and I Pad. I’ve read the New Yorker since grade school because my father expected me to, and when I went off to college, he subscribed for me, the only gift he ever gave me besides home-made blackberry jam with wild Pacific Northwest blackberries. The New Yorker was something safe we could discuss. I read hundreds of literary magazines, some in hard copy but most on my desktop. On my favorites list, I’m up to about 350. I wish I read more books – I’d say I read one a month in old-fashioned hard copy, and that’s just to show up for my summer book club here in Washington. I’ll probably get over this news-reading by fall or winter and get back to my life list of books to check out from the public library! Nothing more delicious to me than an entire shelf of books from the library ready to read. As I said elsewhere, I’m listening to the Gathering in the car, and when my husband and I head to the farmer’s market on Sunday or drive to Seattle or California, we listen to lectures on Shakespeare, 26 lectures and then we start again from the beginning. More deliciousness!